Looks like there might be a iOS 9.3.5 / 9.3.4 jailbreak coming soon for those who have devices still stuck on those older firmware versions. Here are the details. The jailbreak scene has been a little starved of attention of late, with the last public jailbreak released all the way back in July of this year when Pangu team popped up with a new jailbreak for iOS 9.3.3. Since then, there has been new iOS updates that have unfortunately been of no use to those who wished to keep their jailbreak, but it now appears that there may be light at the end of the tunnel for those who not only want to remain jailbroken, but also want to get the benefit of all the fixes and features that new iOS releases afford. 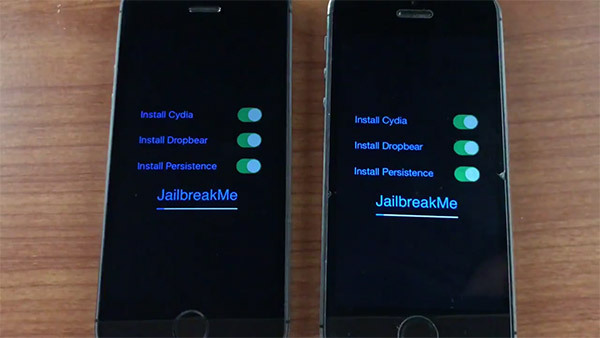 A new video posted by FriedAppleTeam shows what is claimed to be a pair of iPhones being jailbroken on iOS 8.4.1 and iOS 9.3.2. Impressively, iOS 9.3.4 is also jailbreakable via the tool depicted in the video, with support for iOS 9.3.5 also apparently in the works. While this jailbreak may not be useful for many as most people by this time have already updated to iOS 10.x, and Apple is no longer signing iOS 9.3.5/9.3.4, it will still be useful for those who are still rocking older firmware version on previous-gen devices for either performance gains, or other reasons. As we told you recently, there’s a working root exploit available for iOS 10.1.1, which is arguably more exciting news than this one even though a full jailbreak tool based on the exploit has not yet been released, but appears to be coming soon. What these new jailbreak tools and the people working on them show is that the jailbreak scene is far from dead. New tools and new jailbreaks continue to be worked on by those within the community, no matter how many versions of iOS Apple releases, despite whatever new anti-jailbreak code that goes into them. That’s excellent news for those who love their jailbroken iPhones and iPads, but perhaps not such exciting news for Apple. A bit late for the jailbreak party, much? Irrelevant. .can’t downgrade to 9.3.4-5…..
Why would someone waste time in jailbreaking ios9 when ios10 has been here since long and apple won’t sign ios9? Because there are vulnerabilities in iOS 9 that have been patched in iOS 10. May as well use them. True for many people, but some users decided to stay on iOS 9. Plus since there’s vulnerabilities in iOS 9 that are patched in iOS 10, may as well make a tool to jailbreak the firmware for those who decided to stay. And who knows? Maybe someday we’ll be able to revert back to iOS 9. My iPad 3 won’t update past 9.3.5. That’s why. Too many comments saying this is pointless and late. Wrong. Many devices are not eligible for update past 9.3.5. Hell. I still have an iPhone 3GS that is working great and is a handy little compact thing to carry in my purse to keep my kiddo quiet for a few minutes. It is on 6.1.6 because that is as far as Apple let updates go for it. And that is nice because I don’t need to worry about losing my jailbreak on my older devices. All final versions should continue to be worked on as devices become obsolete, in my opinion. 9.3.5 is a final version for some. i got a 6s with ios 9.3.5. I’m actually interested on the jailbreak for my iphone 4s and ipad 3, to be sure i can jump over every ios version as much as i like with odysseus ota.